Known for their lack of a tail, Manx cats have long been desired for their hunting skills and are considered to be social, tame, and active cats. The working cat on the Isle of Man, the breed is highly intelligent with a playful personality—they are very interactive, funny cats who are devoted to their families. In fact, the Manx is often said to be “dog-like” both in their loyalty to their families and their love of play. With rounded eyes, rump, and head, the Manx’s large, stocky build makes this breed a solid cat—while its elongated hind legs means the Manx is also able to jump to great heights and even open doors. The loving, even-tempered Manx cat is likely to get along with all of the people in your family, and will provide many years of affection and companionship. 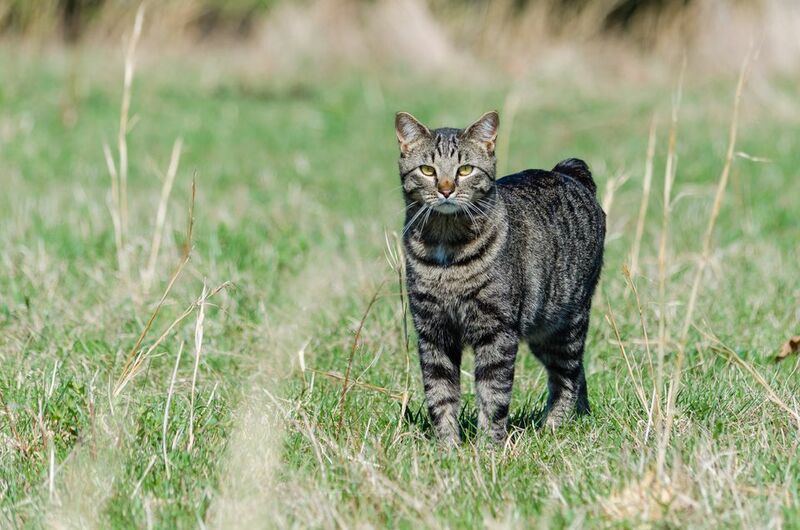 Due to their hunting skills, they have historically been a popular choice by farmers to help with rodent problems, as well as a preferred breed as a ship cat. When given the opportunity, Manx cats are still great hunters—a house with a Manx will never have to worry about mice. Manx cats come in a wide variety of coat colors and patterns; long-haired variants are sometimes considered a separate breed, known as the Cymric. The Manx cat originated on the Isle of Man. Known for having a natural mutation that shortened its tail, today, some Manx cats have a short, stubby tail, but the majority of these cats are completely tailless—in fact, the cats were often referred to as “stubbin” in colloquial Manx language on their home island. In the Manx language, the modern name of the breed is “kayt Manninagh,” which translates to "cat of Mann." Manx itself was often spelled “Manks” in English well into the late 1800s. The Manx were one of the original show cats, and represented in the first cat shows held in Great Britain. Manx cats have been exhibited as a named breed—and with the modern spelling, "Manx"— since the late 1800s, with the first known breed standard published in 1903; today they remain a substantial but declining percentage of the local cat population on the Isle of Man. Today, only the “rumpy,” with no tail at all, or a “rumpy riser,” with only a slight rise of bone where a tail would start, is eligible for competition in the championship classes at Cat Fancier's Association (CFA) cat shows—all other tail lengths may compete in the “All Other Varieties” category. Though Manx cats are considered to be descendants from a mainland stock that’s not completely known, like all house cats, they are still relatives of the African wildcat, as the island was long devoid of European wildcats. Although the original island cats were shorthairs, the longhair gene was likely introduced during rule of the Vikings, when longhaired cats that are ancestors of today’s Norwegian Forest Cats left the Viking ships and mated with the native cats. Many folktales exist about the Manx cat, and all revolve around its lack of a tail—for example, one story claimed that a tailless cat swam ashore from a shipwreck and brought the trait to the island, and some biblical references exist to suggest that when Noah closed the door of the Ark, he accidentally cut off the tail of the Manx cat. Because the tailless gene is so dominant, there was even a belief that simply being in the proximity of a Manx cat could cause other breeds to somehow produce kittens without tails. In truth, Manx cats actually have at least one gene for a full tail, so even two cats carrying the tailless gene can produce a full-tailed kitten, and kittens that do inherit the gene can have tail lengths ranging from a full tail to no tail at all. Populations of tailless cats also exist in a few other places in Europe, such as Cornwall, which is approximately 250 miles from the Isle of Man. Similar cats are also found in Crimea, a near-island peninsula in the Black Sea. The Manx gene may also be related to the similarly dominant tail suppression gene of the recent American Bobtail breed. The Manx was one of the first breeds recognized by the CFA, which was founded in 1908. The predominant United States pedigreed cat registry has records on the breed in North America going back to the 1920s. Manx are very playful cats and have extremely powerful hindquarters; they can jump very high and possess many dog-like characteristics, from retrieving objects to burying their toys. Manx cats can often be found perched upon tables or shelves. This breed will be happiest as a member of a family that has the time to interact and play with them. Manx come in both longhair and shorthair varieties, which both have double coats that should be dense and plush. Shorthairs have an outer coat which is somewhat hard and glossy, and the longhair has a silky coat which is medium in length. Though their double coats make these cats feel soft and luxurious to the touch, owners will need to brush them once or twice a week to remove dead hair. A short, round cat, the Manx breed can be prone to a particularly short spine that can fail to provide proper nerve and muscle endings. This genetic trait of some Manx cats being too short can result in an open spine, lack of bowel or bladder control, and either weak hindquarters or one weak hind leg. The average Manx cat is extremely hearty and not especially prone to major health issues that impact other breeds, such as upper respiratory problems. Like most cats, the Manx requires a balanced diet of protein, vitamins and minerals, fats, and water. Their cat food should include fish oils and Omega 3s to keep their thick coat healthy, while ingredients like taurine are essential for their vision and heart, and fiber for their digestion and weight control. A Manx cat should thrive on either a wet or dry commercially-prepared cat food—be sure to look for foods with meat as the first ingredient. When serving wet food, it may need to be warmed up, as Manx cats aren’t particularly fond of chilled meals. You can also mix wet food in with dry food to enhance flavor. Manx cats shouldn’t be given cow’s milk to drink, as the lactose could build up in the intestines and cause digestive issues. Offering a pet formula milk substitute is fine as an occasional treat, as are “human” food treats like tuna.